"Did you hear them, did you hear these monsters talking about monsters?" Since its acquisition, the price of pyrimethamine has increased from $13.50 per tablet to $750 per tablet, according to IDSA and HIVMA. In an open letter to Turing, the organizations urged the pharmaceutical company to revise its pricing strategy for the generic medication. Shkreli isn’t just a regular, run-of-the-mill pharmaceutical industry monster. He’s a monster who used to work (of course) in finance, a former hedge funder accused of having tried to manipulate FDA regulations on drug companies whose stocks he was shorting. 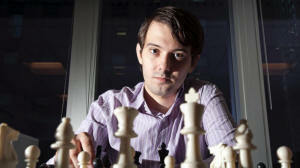 He was forced out of the last drug company he started, which is now suing him for $65 million. He’s also a probable charlatan who has claimed to have invented his own pharmaceuticals, despite his lack of any medical or scientific education. 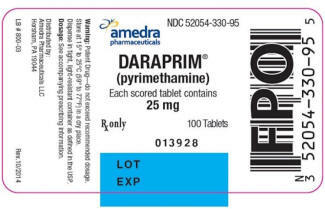 Rothenberg defended Daraprim’s price, saying that the company will use the money it makes from sales to further research treatments for toxoplasmosis. They also plan to invest in marketing and education tools to make people more aware of the disease. Rather than hide and count his blood money, Shkreli is conducting a social media blitz. He spent much of last night bickering with John Carroll, a science writer who runs a pharma news website and has been critical of Shkreli for pulling a nearly identical price-gouging stunt at his last company. @JohnCFierce just a bad journalist who doesn't check facts or think logically. @JohnCFierce I think engaging you would make your head spin. You still have to learn how to read SEC filings, after all. @JohnCFierce No one is reading this. There are no "folks". You are irrelevant. @JohnCFierce You are such a moron. @AceofSpaces2007 @given2tweet you have be blocked, genius. @exophrenologist what if it wasn't priced fairly to begin with...Mind blown?! @AdamR_93 I don't think you have the facts though. Seems you are pulling this frustration from other parts of your life maybe? we assist with copays to ensure copays stay below $20. the insured will pay through insurance. the uninsured will get it for free. This is not the first time that Shkreli’s combined love of parasitical rent-seeking and social media engagement have landed him in hot water. At his last company, Retrophin, shareholders were furious when Shrkeli appeared to tweet hints about company acquisitions before they were officially announced. More recently, three alias Twitter accounts were found to be under the control of unidentified Retrophin employees, according to people familiar with the situation. The link was found after the IP address of one of the alias Twitter accounts matched the IP address of Retrophin’s headquarters. 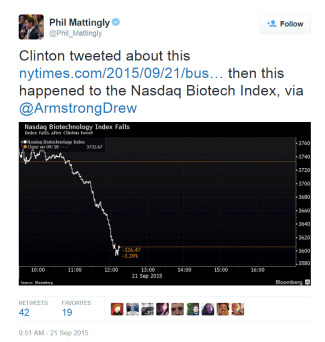 The most prolific of these accounts, @Thug_BioAnalyst, tweeted in “ghetto slang” expressing support for Retrophin and calling out other drug stocks, including TherapeuticsMD (TXMD), as shorts. There appears to be real fear on the part of Big Pharma that the utter shamelessness of this incredibly hatable greedhead could ruin the racket for the respectable and mostly anonymous greedheads in the rest of the industry. Only confirmed followers have access to @MartinShkreli's Tweets and complete profile. Click the "Follow" button to send a follow request.